I am always on the hunt for a good burger in Rome. These are some of my favorites. This is our family's default place. When I don't feel like cooking, or we have friends to meet or we have been cooped up inside on a weekend, the three of us take a walk towards Campo di Fiori and head straight to Open Baladin. Great beer, good burgers and hot homemade potato chips and ketchup keep us coming back. You probably know this as my go to breakfast spot when I have a craving for bacon and eggs. I usually meet up with a great gang of girls and we have been known to stay until almost lunchtime. What you may not know is that usually once a week this pretty spot has a hamburger on the menu. 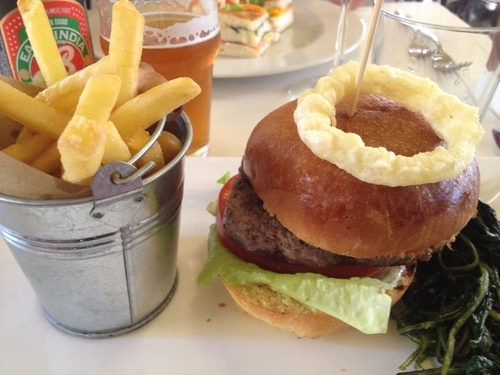 It serves as a fantastic replacement for the no longer available, Tricolore burger. Like the Coromandel page on Facebook or download their new snazzy App to stay up to date for when this very delicious burger is on the menu. Have a craving for an old fashioned, New York City, Greek diner style, burger? Fonzie, a new-ish spot at the entrance to the Ghetto is your place, only with better beer. 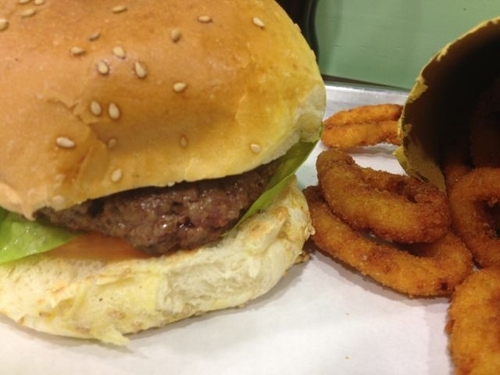 Perch on stools and watch your burger and onion rings get cooked to order. This place keeps Kosher so there are no cheeseburgers on the menu, but you will find chicken wings and fajita wraps and Brooklyn Lager and Anchor Steam. The hamburger here is lean, but perfectly cooked and juicy. Served with thick cut steak fries and a crispy, tangy red cabbage salad. A Brooklyn Indian Ale is the perfect accompaniment to the late 1990's vibe in this spot just aroud the corner from the Trevi Fountain. This place feels like it is off the beaten track, but it is really pretty centrally located near Porta Portese/Trastevere/Testaccio. This cozy pub is decorated with dried hops and cooks just about every dish with it’s own, vast selection of beers. That includes dessert! With great beer goes decent burgers that are made with Chianina beef. There is also an excellent plate of Texas style BBQ. In good weather there is a roof-deck. If you are planning a large party, there are kegs to order. Another reason I love this place is, there is plenty of parking, right out front. You can read about other spots I love for a burgers here and in my ebook Rome for Expats.